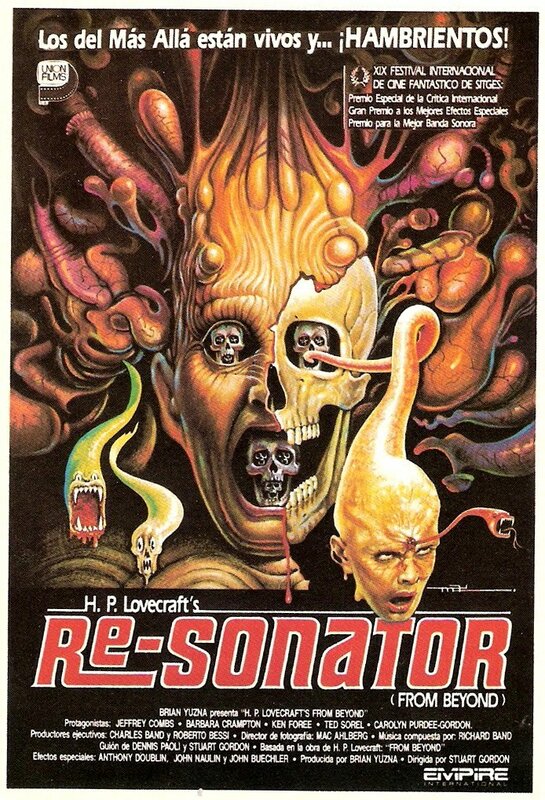 Why do I call this "From Beyond", when the poster very clearly says "Re-Sonator"? 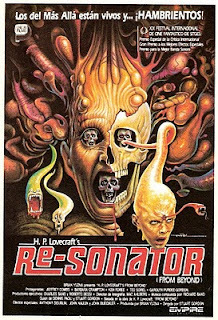 Because I found this über-cool French poster, that tried to cash in on the Re-Animator success. And this is indeed another gem directed by Stuart Gordon and written by Brian Yuzna, a team that has provided many a timeless classic. This time around, they take a swan dive into utter lunacy. If it's them, the main characters, or you the viewer, who is going mad, is not easy to say, but they certainly make the world be flesh, to quote Cronenberg, though he probably never meant it as literary as in From Beyond. Here the borders between reality and the imagined are bent. Thoughts take on a life of their own, and ideas grow into monsters that hunt you down a dark cellar corridor. You will drown in a sea of blood and gore, that run down into your lungs as thick, sticky philosophy. Imagine a Braindead, without the humor, and you're onto something.